The 2018 Otto Hutter Prize has been awarded to Assoc Prof Julia Choate (Monash University). The award was made to recognise Julia's commitment to enhancing and expanding the educational experience for students through the innovative use of technology. Congratuations Julia! An exciting opportunity exists for Australian undergraduate chemistry and biology students to visit Memorial Sloan-Kettering Cancer Center (MSKCC) in New York City on a fully-funded 10-week research experience internship. Spaces are available for both oral and poster presentations from scientists at all levels. The deadline for registration and abstract submission is Sunday 24th March 2019. April 20, 2019 - Kengsington, Sydney. 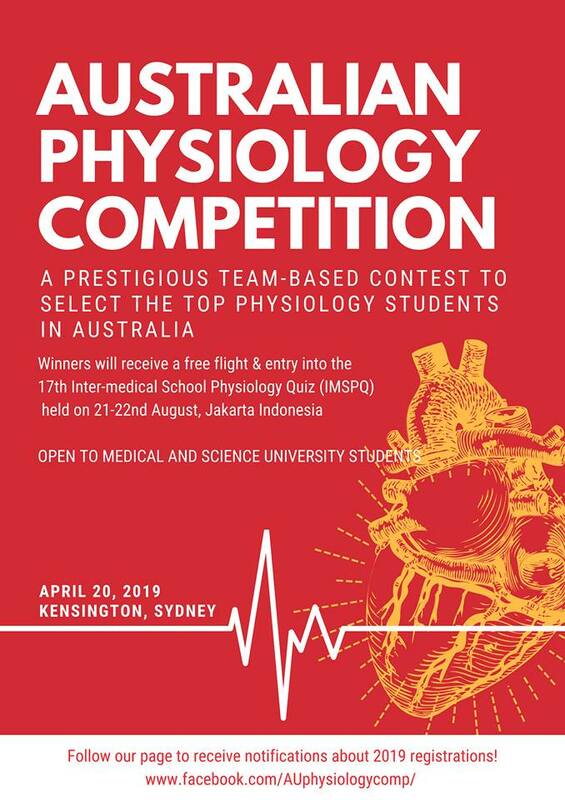 A prestigious team-based contest to select the top physiology students in Australia. Click here for more information. Full-time, Teaching and Research Position. School of Medicine, University of Tasmania. Applications close 4th March 2019. This Scholarship will provide a stipend towards the living expenses of a PhD student to learn to use intracellular electrophysiological recordings to develop cannabinoid compounds as potential new drugs to restore synaptic function in mouse models of myasthenia gravis. For further information visit https://sydney.edu.au/research/opportunities/opportunities/2506 or email Bill Phillips (William.phillips@sydney.edu.au) or Stephen Reddel (swreddel@sydneyneurology.com.au). The College of Medicine and Public Health at Flinders University, Adelaide has just opened applications for a series of new positions including permanent research-only positions as well as balanced academic positions as part of our restructure. These range from Level B-D and are targeted at the next generation of researchers. We are creating a network to connect researchers who can investigate functional genomics of newly discovered genes and variants. If you are a researcher who can investigate the mechanisms of gene variants using in vitro, in vivo or in silico methods, we want you to register your interest in Australian Functional Genomics!